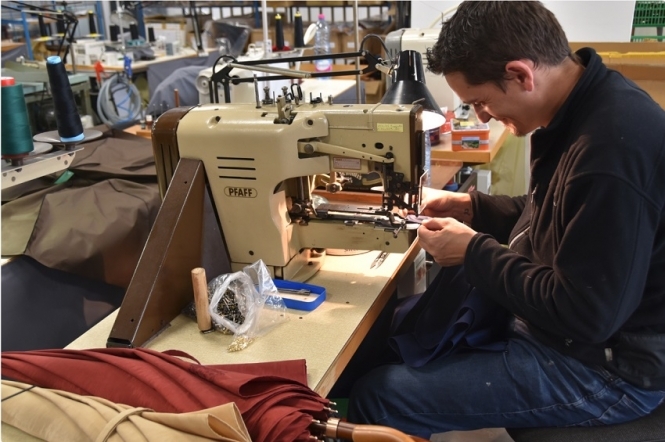 Umbrellas are an essential item for protection against seasonal spring showers – and one company in Cherbourg is finding this universal and most basic of accessories is still extremely popular. Charles Yvon, 31, took on the family business, Le Véritable Cherbourg (parapluiedecherbourg.com) when his father retired – and explains what makes a successful family business. What inspired your father to start making umbrellas? In 1964, a popular film was released, starring Catherine Deneuve called Les Parapluies de Cherbourg, which won the Palme d’Or at the Cannes Film Festival. It was the first film to be entirely sung and filmed in the streets of Cherbourg and made the town famous. My father was a fashion photographer who worked all over the world, but eventually he decided to come back to his home town and in 1986, inspired by the film and by the world of fashion he created Le Véritable Cherbourg company to make quality umbrellas.